A new era in neutrino physics in the United States is underway, and UW–Madison's Physical Sciences Laboratory (PSL) in Stoughton is playing a key role. Groundbreaking ceremonies for the Long-Baseline Neutrino Facility (LBNF) will be held simultaneously today at the Sanford Lab in South Dakota and at Fermilab in Illinois. 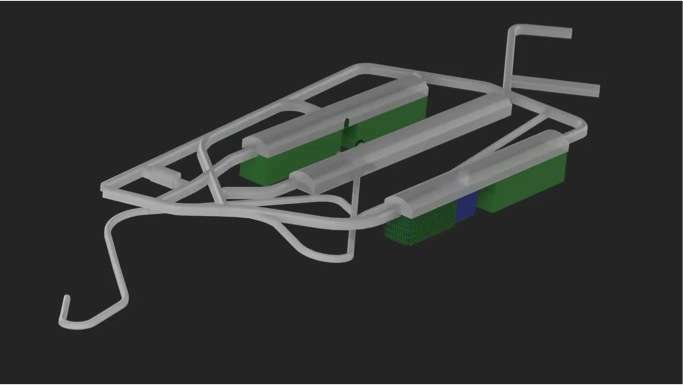 The facility will provide the neutrino beam and the infrastructure that will support the DUNE detectors, taking advantage of Fermilab's powerful particle accelerator complex and Sanford Lab's deep underground areas within a long, existing tunnel carved out during the gold mining days of the 1930s. Once the first shovel of earth is turned, crews will excavate more than 800,000 tons of rock—approximately the weight of eight aircraft carriers—to create huge underground caverns for the assembly of enormous particle detectors, all to better understand the mysterious neutrino. DUNE was conceived, designed and will be built by a team of 1,000 scientists and engineers from more than 30 countries and 160 institutions, including UW–Madison. 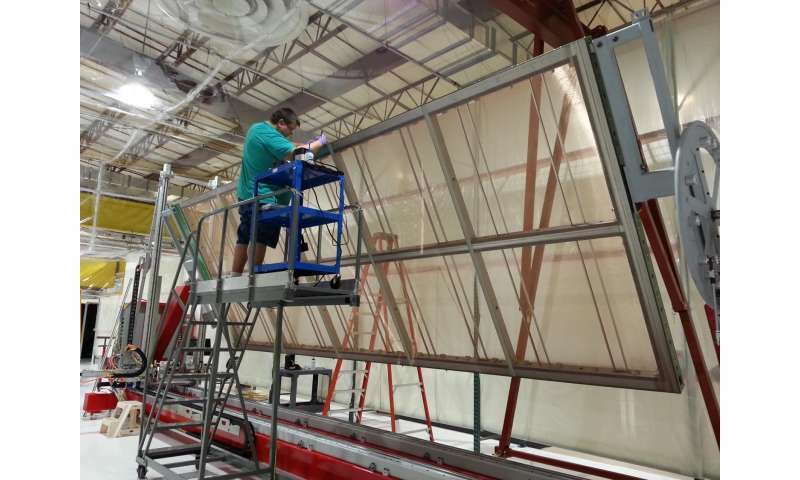 The detectors will be made up of large panels (the APAs) that will be submerged in liquid argon. The APAs consist of ultrathin wires wound around metal. Each assembly created at the UW's PSL consists of a stainless steel frame that is 20 feet long, a layer of copper mesh, and almost 15 miles of very thin (150 micron diameter) copper beryllium wire wound around it in four layers. The wire is then attached to a circuit board to track neutrinos. Overseeing PSL's work on DUNE is the lab's director, Bob Paulos. "The APAs are really the heart of the detector," Paulos says. PSL will build three APAs for a prototype experiment called ProtoDUNE. UW–Madison is collaborating with several institutions in the United Kingdom, which will build three more prototype APAs utilizing PSL's design. They have built an exact copy of the PSL wire-winding robot along with all of the other tooling necessary to build the devices. Ensuring specific wire tension and pitch is critical to the success of the APAs. "The ultimate plan is to build four detector modules underground in South Dakota. Each module will be two-thirds the size of a football field and comprise 150 APAs," Paulos says. Construction on the modules is expected to begin in 2020. PSL will join a couple of other labs to build the full suite of APAs that are needed for the full-scale DUNE detector. "There is a lot of international cooperation on this project," Paulos says. "It's going to take worldwide contributions to make DUNE happen and we are excited that PSL is playing an important role." In addition to building APAs, the UW–Madison lab has designed and built detector structure support for the project. A PSL engineer and technician are at CERN (the European Organization for Nuclear Research) helping put the hardware together for ProtoDUNE. "With this groundbreaking, UW–Madison's Physical Sciences Laboratory reaches another achievement in its already illustrious history in global neutrino research," says Marsha Mailick, UW–Madison vice chancellor for research and graduate education. "The Physical Sciences Laboratory has played integral roles in the success of such sophisticated science experiments as the IceCube Neutrino Observatory at the South Pole and the Large Hadron Collider at CERN in Switzerland." "This has been a great team effort at PSL with people working long hours to meet very tight deadlines to keep the project on track," says Paulos. "Nearly everyone who works at PSL has had a hand in this project at one time or another, with a core group of about a dozen people working primarily on the project for a year." Why the UW–Madison Physical Sciences Laboratory? "PSL has a long history of working in high-energy physics," explains Paulos. "That, along with the fact we have the right mix of engineering, design and fabrication expertise, as well as state-of-the-art machinery and an electronics shop that is big enough to build the APAs in a clean assembly area, positions us to be able to do this kind of work." PSL has completed about $10 million in work on the DUNE project to date. The first APA was shipped from the PSL on July 7 and arrived at CERN on July 12. The panel is part of the ProtoDUNE detector, a prototype for the massive Far Detector that will eventually be housed underground in South Dakota. The Far Detector is a Time Projection Chamber (TPC), a type of particle detector that uses a strong electronic field together with a sensitive volume of gas or liquid to perform a three-dimensional reconstruction of a particle trajectory or interaction. In the case of DUNE, the TPC will be positioned within a cryostat filled with argon. Eventually, DUNE will consist of two particle detectors placed in the world's most intense neutrino beam. One detector will record particle interactions near the source of the beam, at Fermilab, while the other, filled with 70,000 tons of liquid argon and cooled to –300 degrees Fahrenheit, will take snapshots of interactions deep underground at the Sanford Lab. As neutrinos interact with the cold liquid, they create a shower of other particles and light. Those particle tracks are then picked up by APA electronics and transmitted as data to the surface. Neutrinos are the most abundant particles of matter in the universe, yet very little is known about their role in the way the universe evolved. DUNE will enable scientists to look for differences in the behavior of neutrinos and their antimatter counterparts, antineutrinos, which could provide essential clues as to why we live in a matter-dominated universe—in other words, why we are all here, instead of our universe having been annihilated just after the Big Bang. DUNE will also watch for neutrinos produced by supernovae, which scientists can use to look for the formation of neutron stars or even black holes. The large DUNE detectors also will allow scientists to look for the predicted but never-observed subatomic phenomenon of proton decay, a process closely tied to the development of a unified theory of energy and matter.